Upstage Video recently provided video support for the Greenbrier Classic, held in White Sulphur Springs, WV. In White Sulphur Springs, WV, the Greenbrier Resort has held its yearly Classic PGA tournament since 1979. Each year, the coverage gets more technically complex, which allows spectators to get full coverage of the event no matter where they are on the resort’s course. 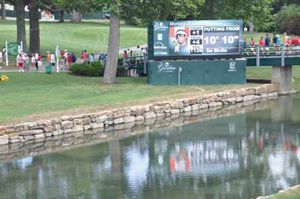 This past July, Pottstown, PA’s Upstage Video handled video for the 2010 event, employing large LED displays throughout the course. Upstage Video’s video setup was fed to two LED screens on remote locations from a central control room. In the end, the project was a huge success, and Matthews equates that to having the right products for any situation.